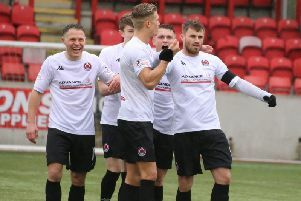 The away tie against Larkhall Thistle ended in a disappointing result for Kilsyth Rangers who were looking to secure their first league win of the season. In the end they could not handle the robust Larkhall attack and playing for most of the second half with ten men did not help their chances. An early goal for Rangers was wanted and it came after eight minutes when Falconer got his head to a corner kick to direct the ball to the net. On 15 minutes it was Rangers who struck again after some very good leading up play Smith beat the goalkeeper to a loose ball and netted from close in. McStay pulled one back on the half hour mark for Larkhall with a well directed header. That was how it stayed until halftime although Rangers had arguably been the better side in the first period. Rangers had made a change at the interval with McLaughlin coming on for Farrell. The second half was only a couple of minutes old when McStay again got a good ball and despite being hampered by a Rangers defender got the ball in the net, the referee could perhaps have given a penalty but the goal stood and Larkhall were back on lever terms. Worse was to come just another couple of minutes in: again there was a bit of a fracas in the Rangers area, Denholm was shown a red card and a free-kick given right on the edge of the box although it produced nothing of note. There was no doubt who was dominant now and it was only a matter of time before Larkhall took the lead. Again it was McStay who beat Kane to the ball and completed his hat trick. Larkhall had also gone down to 10 men with Innes getting his marching orders and Falconer getting a yellow card. There were a few more changes made as the game neared its conclusion, Dolan had come on but did little to change the game. Rangers need to work hard if they are to climb the table.